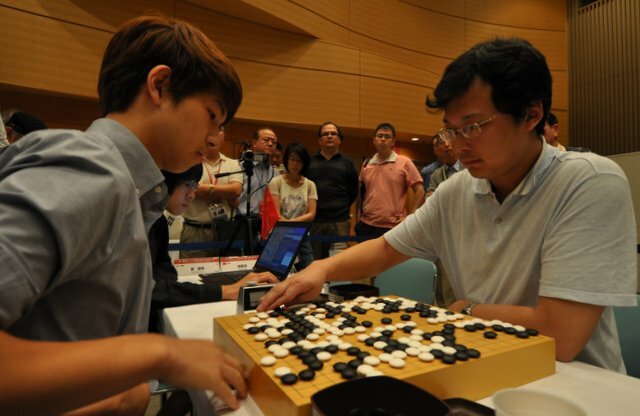 Korea’s Hyunjae Choi (left) virtually locked up the 2013 World Amateur Go Championship in the sixth round Tuesday afternoon with a solid 4.5-point win over China’s Yuqing Hu (right) for a perfect 6-0 record (click here for the game record with commentary by Michael Redmond 9P); Hu will almost certainly take second place. But with the two final rounds yet to play on Wednesday, the rest of the top slots are still very much up for grabs. Five-game winners include Ilya Shikshin of Russia (who beat Japan in the sixth round), Artem Kachanovskyi of the Ukraine (who defeated Finland in the 6th), Nikola Mitic of Serbia and Canada’s Bill Lin, who lost to Korea in the fifth round Tuesday morning and narrowly bested Chinese Taipei by 1.5 points in the sixth. The win by Korea ends a two-year run by China, which won the WAGC in both 2012 and 2011. Kikou Emura’s back-to-back losses on Tuesday extinguished Japan’s hopes of recapturing the WAGC title for the first time since Satoshi Hiraoka won in 2006.